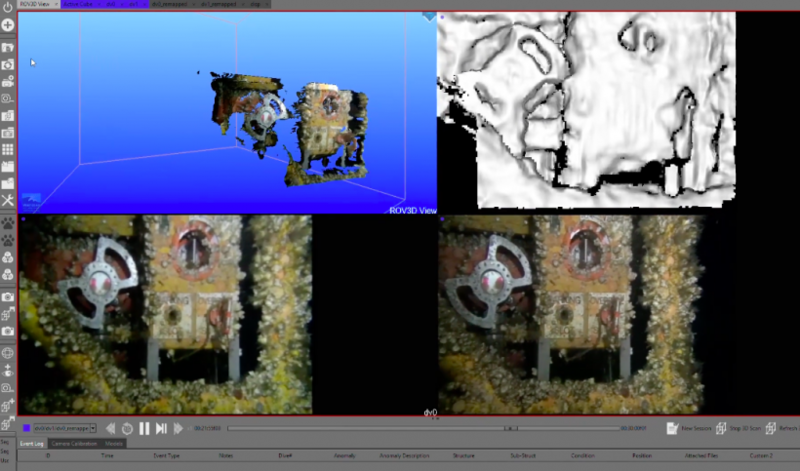 The ROV3D software in action. The offshore oil fields around Newfoundland and Labrador have birthed a city of underwater drills and pipelines that are hard to monitor. New software from WhiteCap Scientific allows oil companies to see and interact with these underwater structures from a desktop. The St. John's-based company has created ROV3D, which it describes as an upgrade on video inspections traditionally done by remotely operated vehicles, or ROVs. The new product generates interactive 3D reconstructions from video footage captured on unmanned vehicles, allowing inspectors to examine all parts of their “subsea factories” in greater detail. Bromley said companies that have offshore oil rigs currently rely on two-dimensional video feeds to inspect their equipment. By using 3D reconstructions, oil companies can make quicker decisions regarding their underwater equipment and potentially prevent oil spills and other tragedies. Since launching the ROV3D software in 2014, WhiteCap has worked with big industry players like BP, Shell, Exxon and Maersk. Bromley said the company has just finished a month-long campaign with Suncor, a Canadian oil company that operates the Terra Nova oil field. WhiteCap was one of 12 companies to graduate from the first cohort of the Creative Destruction Lab Atlantic division. Through that program, Bromley travelled to Toronto to take part in the CDL Super Session, which celebrated the graduates. Bromley and his company had been working out of the Genesis Centre at Memorial University but have moved into their own office space in downtown St. John’s. With key customers now in his rolodex, Bromley plans to expand into the huge oil and gas industry in his own backyard. There are four major oil fields in Newfoundland waters: the White Rose; Hibernia; Hebron, and Terra Nova. In Feburary, the province announced a 12-year plan to double the amount of oil produced from those fields to 650,000 barrels a day by 2030. And now that ROV3D has been verified as a software solution for the oil and gas sector, Bromley plans to tackle new verticals, or target industries, that would benefit from his technology.